It was the final day of the WGL assessment today. The weather was, again, a bit on the changeable side but we managed to find a nice spot around Moel Faban (above Bethesda). The weather did improve after lunch but it was bitterly cold with a dusting of snow above about 700m. A great day with fine views over towards Anglesey. I'm over at Plas y Brenin again this weekend working on a WGL assessment. There are 7 candidates on the course who mostly work on the Duke of Edinburgh Awards scheme. We were over by the North Wales coast today in the Tal y Fan area looking at navigational skills. Once we returned to the centre and had dinner we left at about 8 to carry out some navigation in the dark. Unfortunately, it had been damp and dreary all day around Capel Curig but we were rewarded with lovely weather during the day but the night nav was quite wet. The photo is of the team at Maeni Hirion above Penmaenmawr. It was day 2 on the winter navigation course at Plas y Brenin today. We considered the weather forecast and Colin and Carl discussed what they would like to get out of the day so we decided that The Moelwynion would be a good choice. 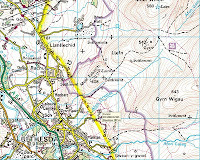 We went up Cnicht from Gelli Iago and then navigated over to Llynnau'r Cwn and down to the road via Llyn Llagi. If you'd like to see more photos of the course please follow this link. Top: Colin and Carl on the summit of Cnicht. Bottom: NE ridge of Cnicht with Llyn y Biswail. I'm working for Plas y Brenin this weekend running a winter navigation course. As there isn't much in the way of winter conditions we decided that a long mountain day would be best so that we could look at map interpretation, compass work, pacing, timing and the use of 1:50,000 and 1:25,000 maps. We were dropped off at Pen y Pass and then made our way up Glyder Fawr and then followed the ridge all the way back to Plas y Brenin via Glyder Fach and Y Foel Goch. We left the centre late so that we could do some night nav on the way down and got back just in time for supper at 7. The photo's are of Tryfan and Colin and Carl approaching the top of Glyder Fawr. 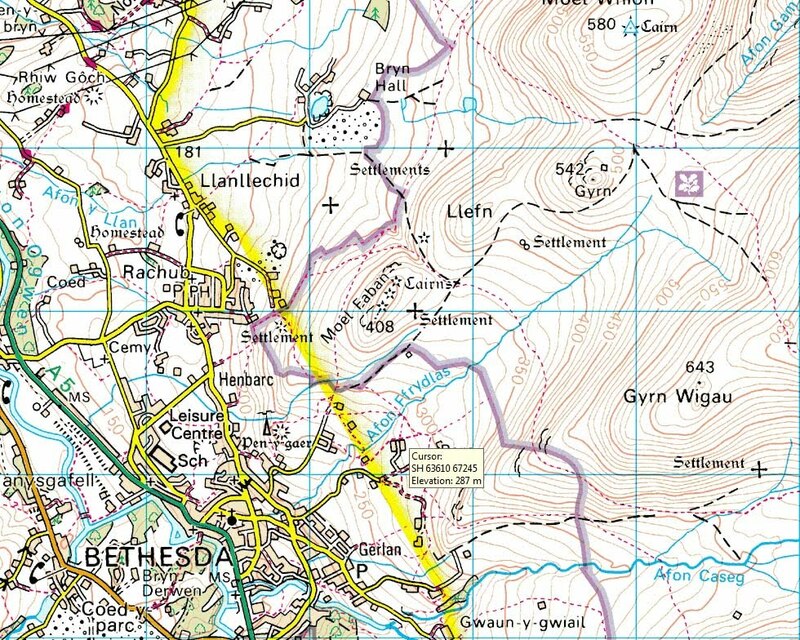 As there was a good weather forecast today I decided to venture up Moel Eilio (726m) and then follow the ridge to Foel Goch (605m) via Foel Gron. There was a surprising amount of people around today doing this fantastic circular trip. It felt quite cold in the wind but it stayed dry all morning with the cloud cover just above the tops (apart from Snowdon!). I tracked my journey with Endomondo so if you're interested click here. Bottom photo - Moel Eilio with point 629m in the foreground. The weather wasn't so good today with a lot of mist and rain around. We covered equipment choice indoors and crampon work on the "glacier" in the trees during the morning and then we spent the afternoon looking at basic ropework and belaying techniques. As you can see from the photo's, the weather did improve in the afternoon which made the session even more constructive. You can check out more photo's on my Flickr site by clicking here . I'm working on a winter skills course for Plas y Brenin this weekend but the conditions are far from perfect for winter skills. We ventured up Pen yr Ole Wen (978m) and Carnedd Dafydd (1044m) but, as you can see from the photos, there isn't much in the way of winter conditions in Snowdonia at the moment. We covered subjects such as navigation, scrambling on rocky ground, mountain safety, route finding, equipment and tried to put it into a winter context. It was a stunning day and the group were very enthusiastic. What a fantastic day. Light winds, blue skies and cold temperatures combined to make a stunning day out on the hills. I made an ascent of Moelwyn Mawr (770m) and Moelwyn Bach (710m) from Croesor today and didn't meet a soul all day. There was just a dusting of graupel from about 700m and a bit of ice in the shade. I tracked my route with Endomondo so if you'd like to take a look click here. Birch Polypore or Razor Strop Fungus (Piptoporus betulinus).